Give your dog his own personal Cool Pup Splash About Dog Pool. 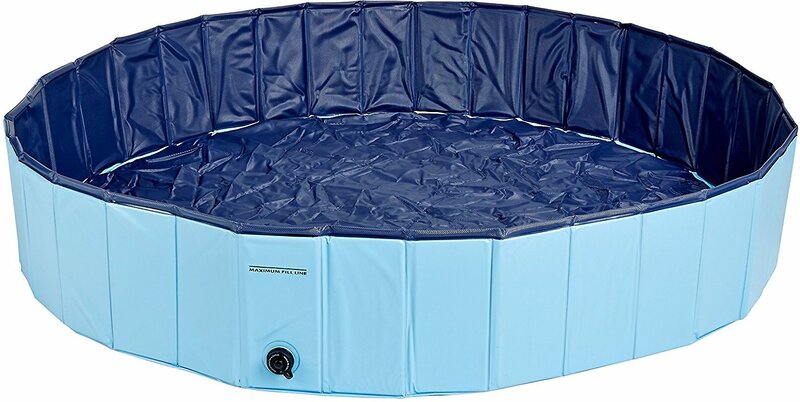 This extra-tough PVC swimming pool is portable and folds up nicely making it easy enough to take along on vacations. Simply unfold, fill up with water and set up in the backyard, on the deck or on the patio. Your pup will happily splash around for hours and hours of fun. It’s perfect for a refreshing dip during those scorching hot summer days. And it’s easy to store during the winter months. Always set the pool up on a smooth, level surface without rocks or similar sharp objects underneath the pool. 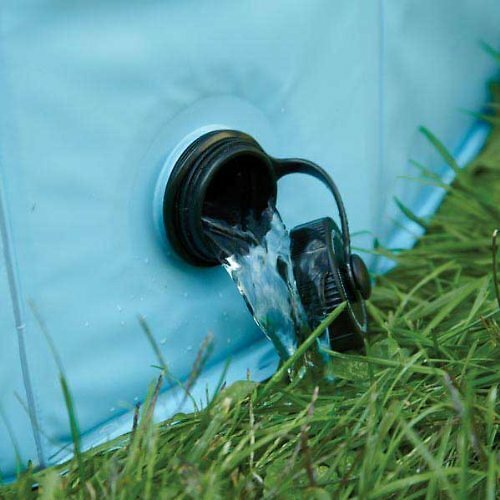 This extra-tough PVC swimming pool is portable and folds up so you can take it along with you. Simply unfold and set up in the backyard, on the deck, or on the patio—the pool will inflate as you fill it with water! It’s perfect for a refreshing dip during those scorching hot summer days, so you can keep your dog cool and healthy the fun way. Always set the pool up on a smooth, level surface without rocks or similar sharp objects underneath the pool. Easy to fold and store out of the way during the winter months. Do not leave pets or small children unattended near pool. Supervise your pets while they are playing or bathing. Do not allow pets to chew or stand on pool edge. Do not sit on pool edge. Empty pool after use. Always set pool up on a smooth, level surface. Make sure there are no sharp rocks or similar items underneath the pool. Do not fill pool more than 3/4 full with water. Rinse clean after each use. Dry thoroughly. If you are mobility impaired, don't buy this! We love this pool!! I had my doubts on the collapsible construction of the pool, but it didnt cave at all when filling it. The material is great, and seems to be very sturdy. My pup ran around the yard diving in and tripped over the wall a few times, but it held up still. We hope chewy will continue to offer this product, as I think I will need to get the large next year. Overall, amazing!!! Chewey.com is the best!! The pool was so easy to set up and it was filled in 1/2 hour!! I could not believe how nice, sturdy and easy this was - it does not leak, it is simple to drain and it is actually comfortable and durable for our dog. Plus, especially Chewey is exceptional on delivery. We ordered the pool on a Sunday morning around 11am. The next day, Monday, it was on the porch by noon!!! Please everyone- do yourself a favor and order from this place. Quality all the way!!! This pool has very cleverly designed sides. The way they fold up makes it very convenient to move it. Unfortunately, the floor of the pool is not thick enough to withstand dog claws. My dogs used the pool once, and then I had to patch it. Thinking things through now, I wonder how often people need to move their dog pools. How often does a pool need to hold water? Perhaps the designers of this pool need to think more practically before adding clever ideas. Great idea, but needs improvement. This pool is well constructed and easy to set up and take down. The drain helps but you still need to push a side down old school to drain most of the bottom but not a big deal. This pool is big enough for both my 95lb labs to be in it at the same time. Material is tough, my labs are big rough bulls in china shops and this stands up very well to their antics and nails. I live in Florida so this is a great way for them to cool off and have fun. I would definitely recommend this product. Well the first time I used it I thought this is the best freaking dog pool in the world. Popped right up, filled it with water - drains easy, and the dog loves it. But since I live in mosquito country, I need to drain it and refill often. That doesn’t work. After the water drains, the pool sides collapse. Then when you try to fill it, it is a battle to keep the sides up while it is filling - water is pouring out of it as fast you are adding to it. You can’t just lay a hose it and walk away. It wouldn’t be so bad, if there was another adult to hold up the other side while it fills. Once it is half way full, it stays open. Also very difficult to clean due to the collapsed sides. My fur kids thought having a 36” inch plastic 8” deep pool was lots of fun. I purchased this large pool when 90 degree heatwave days were forecasted. It arrived in three days and my fur kids love this pool! Deep and big enough for multiples. They can lay down and still keep their head above water! Perfect fit for a Pom. This was a perfect gift. I got this for my dogs for his birthday and as soon as he opened it he got right in (with No water). So I got it set up outside on our deck and he jumped in with no problems and laid in it as it was a very hot day. Very easily to set up and put away.